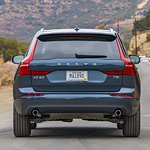 The Volvo XC60 R-Design trim pampers drivers and passengers alike with features such as leather seats, touchscreen communications technologies, and clean cut Scandinavian interior design motifs. The Volvo XC60 Polestar version takes a walk on the green side by providing operators with a hybrid engine capable of emission-free operation. That said, the Polestar is still capable of putting out a neat 415-hp through its dual electric and gas motors.